Two leading Thai banks bank big on Facebook banking – Kasikornbank and Bank of Ayudha – helping customers save routine expenses and increase their wealth from financial tips posted on the banks’ Facebook fanpages. Bangkok has now 8.68 million Facebook users, making social media a powerful influence among Thais. 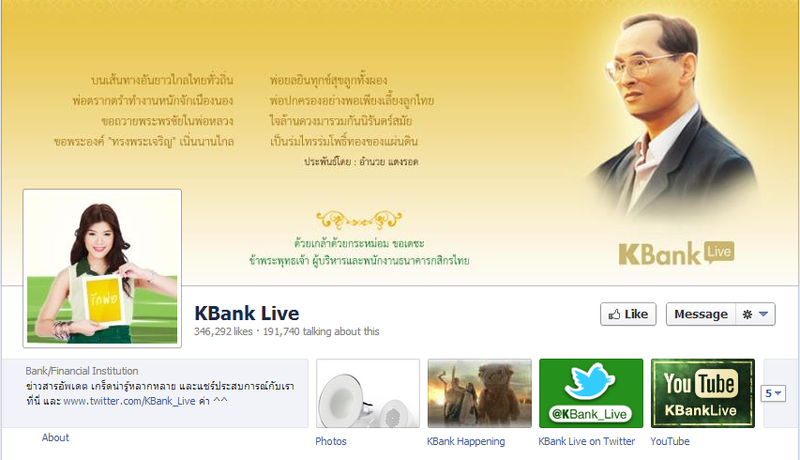 Kbank Live, Kasikornbank’s Facebook page, ranks first in fanpages with 340,000 fans. Art Wichiencharon said that Facebook should start integration between customers and the bank rather than a sales point. Kbank was launched in September 2009 and garnered 200,000 fans in a year. Today, the number of fans increased 70% with their financial and non-financial content. The fanpage aims to maintain its position and strengthen customer relationship through social networks. Ranking fourth, Krungsri Simple of the Bank of Ayudha uses lifestyle content to provide their customers with a different experience. Providing 80% lifestyle and 20% financial content, the page has garnered 127,000 fans. According to Philip Tan, Krungsri Simple is part of the bank’s move to upgrade Thai’s e-bank. The bank plans to develop facebook fans and friends to become its customers by building and strengthening their trust gradually. The Krungsri group’s e-business unit has three teams that monitor, source, and distribute content of all digital channels and plans to improve them and its Facebook page to create a different experience. In you opinion, what are the most advanced and engaging banking pages on facebook? We invite you to share your thoughts about banking on facebook here, via twitter or on our Facebook page.